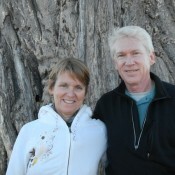 A few weeks ago Tish and I made a trip with friends to the Tuli-Block. 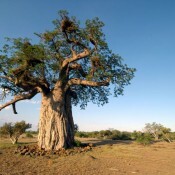 This huge area (almost 2 million acres) in North East Botswana is home to several game preserves. 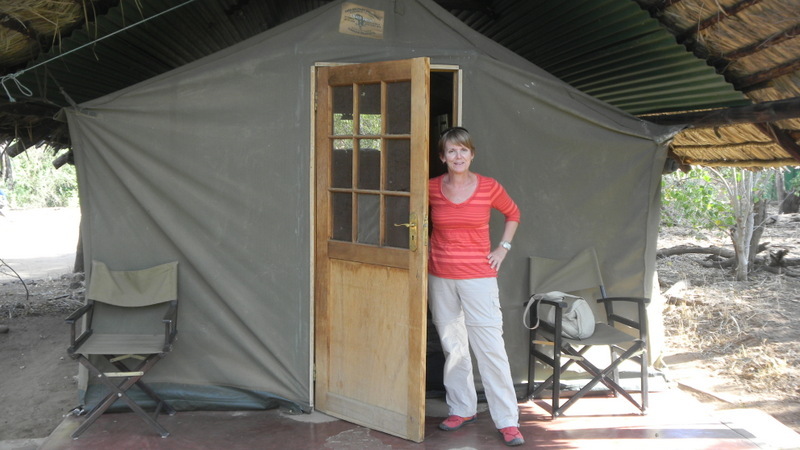 We were headed to the Nokolodi Tent Camp near Tuli Safari Lodge in the Tuli-Block. The trip was an opportunity to spend time with a few of our Bots-10 friends (Susan and Charlie), and to say goodbye to Chuck and Mary McGee who are in Bots-9 and were completing their service and returning to America soon. 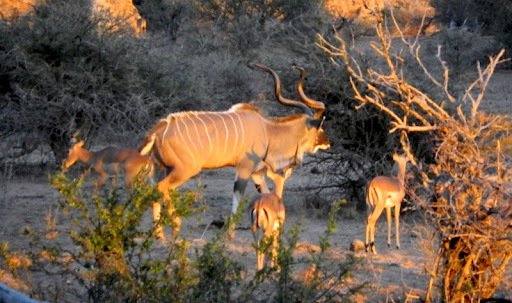 Going to Tuli-Block was our second opportunity to see African wildlife. 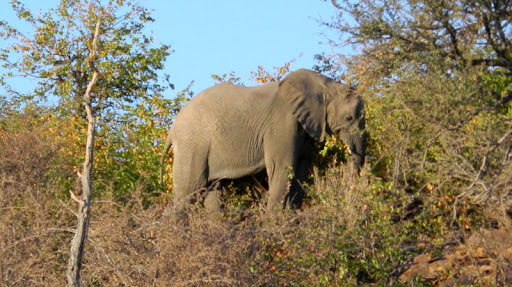 We had been to the Khama Rhino sanctuary and saw some wildlife, but no elephants and no cats. I hoped to see those things at Tuli-Block. Our trip began, as always, with a bus ride to Gabs. At the bus rank in Gabs we found the bus to Selebi Phikwe, boarded and began the four hour trip to the village where Mary and Chuck live. Halfway there we passed through the village of Mahalapye, where we stopped to drop off and pick up passengers. I was glancing out the window watching the chaos that is a bus rank. I watched people queuing to get on busses, vendors getting on and off busses carrying their wares, vendors holding their wares up trying to entice people on the busses to buy through their windows, and people selling things from tables. In the midst of all this, in the crowd I spotted a white lady, and then another. Funny thing is when we see white people in Mochudi or some other small village we are just as curious and interested as the Batswana are, because they are rare. I turned to Tish and said, “Hey there is a white lady coming this way”. Then I saw who it was, it was our friends Susan and Charlie, who climbed on the bus and sat near us for the rest of the trip. Tish and I had been in Selebi-Phikwe once before. 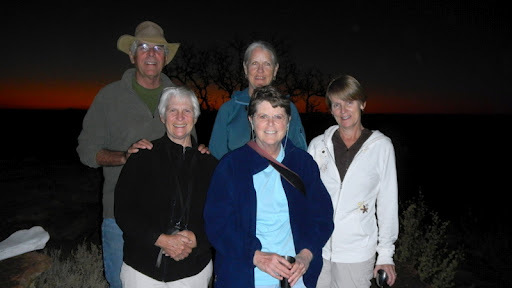 In May 2011 when we were still in PST we “shadowed” Chuck and Mary for a few days as part of our Peace Corps training and began a good friendship with them. 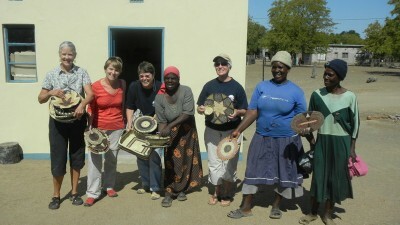 They are older volunteers like us with grown children and we have a lot in common with them. Chuck’s Peace Corps job title is District Community Liaison (DCL), same as mine, and I picked his brain about some of the things he was doing in his District Aids Coordinator (DAC) office. I specifically wanted to learn more from Chuck about the newsletter he created there and the web site he created for his DAC office. During his service, Chuck brought a lot to his office and did much for members of his community. I learned that Chuck actually paid for the design and hosting of the web site himself. In Chuck’s village there are many more examples of his generosity that I am aware of. He made himself open to private one-on-one consulting with individuals who wanted to better themselves. He did more than just consult. Two examples: Chuck paid from his own pocket to help a Motswana be tutored and re-take his college exams so he could attend the University. Chuck also paid the rent for a building so two young men could begin a carpentry business. 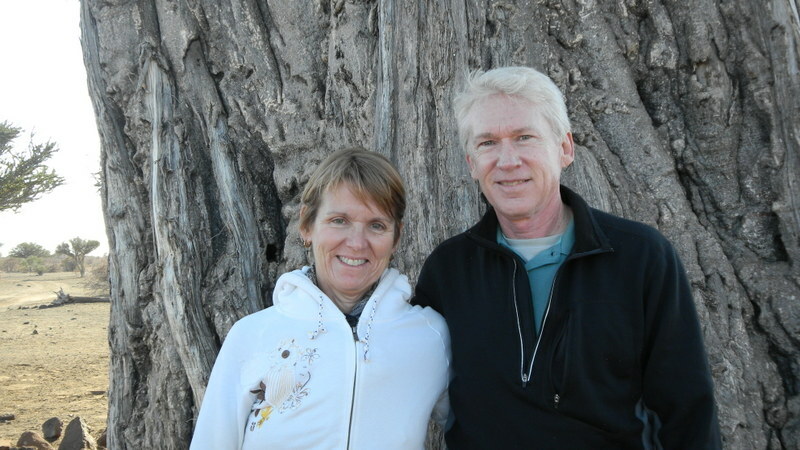 In keeping with their generous spirit, they are awesome hosts. Susan, Charlie, Tish and I got the full Chuck and Mary B&B treatment that night. We had a nice meal, great conversation and planned for the trip. The next morning we packed up a vehicle Mary had borrowed from the director of Mothers for All, the NGO where she has worked for the last two years. 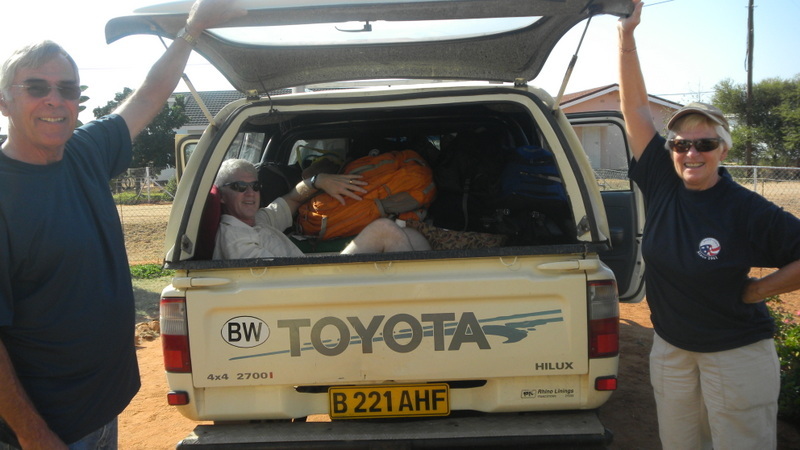 It was a typical Botswana vehicle, an older model small pickup with front and back seats and a cover over the bed of the pickup. We had two in the front seat, three in the back seat and someone had to sit in the back of the pickup. We loaded folding chairs, ice chests, bags of food, cooking utensils, our backpacks and there was just enough room to put down some cushions for the person sitting in the back. The trip to Tuli-Block took about three hours. The first half was on tarred roads, followed by a long stretch on bumpy dirt roads. The roads were in really bad shape with huge dips in places. There were no other vehicles on the road so Chuck could drive wherever he wanted to. Chuck would drive on the left, right or center, wherever it looked smoothest. The car took a beating, as did the person in the back of the pickup. We took turns back there. We saw our first animals on the drive, before we ever arrived a Tuli-Block. There were several giraffes near the road grazing. We made a couple of stops along the way. 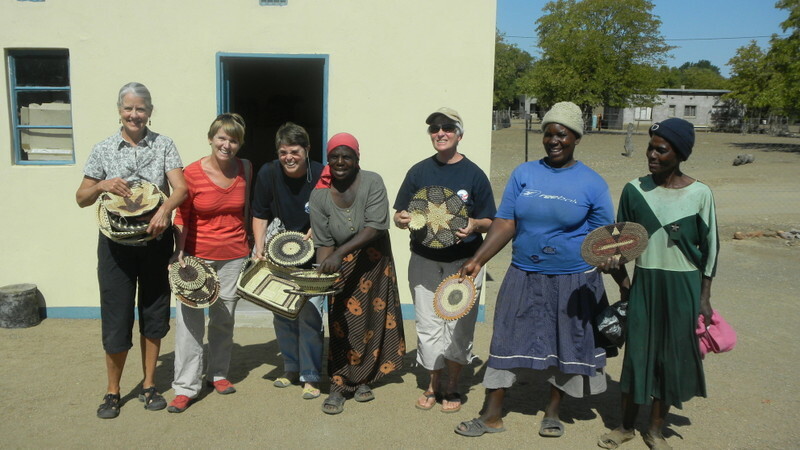 One stop was in the small village of Mathathane where three local ladies had a small business making and selling traditional baskets. They were so happy to get our business that they would spontaneously ululate and dance around. I love it when they do that. It occurred to me that being in the Peace Corps and living in Africa as opposed to visiting Africa gives us opportunities to see sites most tourists would not see. 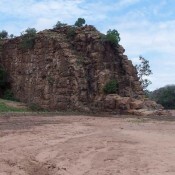 For example, on the way to the Tuli-Block, we took a side trip and crossed over the dry riverbed of the Motloutse River and were able to see a unique geological feature of the region called Solomon’s Wall. 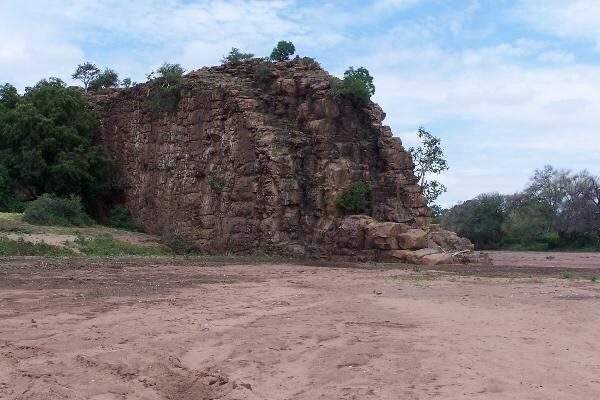 It is a naturally occurring “wall” of rocks about 100 feet high stretching for many miles. In this section the river had eroded a section in the natural wall, which we were passing through. We got out of the truck as Chuck drove across so the vehicle would not get stuck in the soft sand of the dry riverbed. It was hot as we walked across the dry riverbed, we could see elephant footprints in the sand and elephant droppings. We entered Tuli-Block and continued on toward the area we would be camping in. The region was beautiful and desolate. It looked like desert sprinkled liberally with millions of stones, small rocks under our feet to boulders and outcroppings of rocks hundreds of feet high. The vegetation was sparse until we got closer to the Limpopo River which marks the border with South Africa. 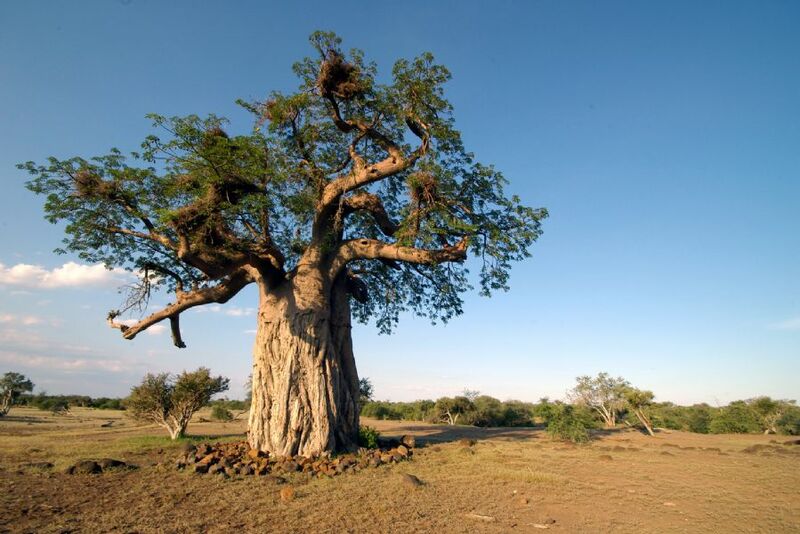 The huge Baobob trees did grow in the drier areas and is a spectacular tree. Closer to the river we began to see other massive and beautiful trees. We arrived at our destination and despite its remoteness we were surprised to arrive at the very beautiful Tuli Safari Lodge. There were animals everywhere. Small steenbok grazed on the manicured lawns while monkeys swung in the trees. A very ugly family of warthogs were rooting around near the reception area. We were not staying at the lodge, however, we were camping at Nokalodi Tent Camp. After checking in we were taken to our camp site. It consisted of five semi-permanent tents, a kitchen and an outdoor braii and firepit area underneath a beautiful tree where we spent a lot of time over the next few days. The tents were interesting. They were large wall tents with plenty of room for twin beds and an armoir. The tents were permanently set up on a concrete slab. 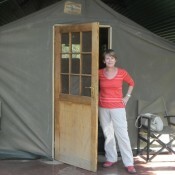 A regular door was put on the front and back of the tent. The back of the tent opened onto a bathroom area with privacy provided by a chest high wall of stone. There was electricity and an overhead light. We were told to be sure and keep the doors locked because the monkeys are naughty. Over everything was a large thatched roof supported by wooden poles. We arrived at dusk on Friday. 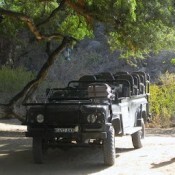 The plan was for us to have a morning and evening game drive on Saturday and leave Sunday morning. 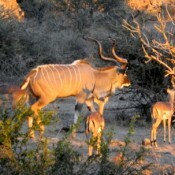 The game drives were wonderful. On both drives we saw elephants, kudu, springbok, impala, eland, zebras, mongoose, giraffes and many other creatures, in their natural habitat. 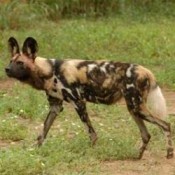 The highlight of the morning for me was seeing African Wild Dogs hunting. These animals are quite rare. Our driver was communicating with other safari vehicles via radio and got word of the wild dogs on the move. 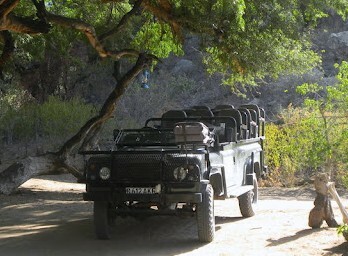 Our safari vehicle was a large Land Rover with three rows of seats for passengers, quite high off the ground. There were no sides to the vehicle so passengers have an unobstructed view. When our driver got word of the wild dogs, he drove to where they were and we paralleled them as they moved through the bush. They looked like a very disciplined group moving with purpose through the bush. There were about 10 of them. We followed them for a while and suddenly they just all sat down. We were able to get some good pictures of them as we observed them relaxing. After five or ten minutes far in the distance there was the sound of a wild dog barking. This bark was obviously some kind of signal for the group we were watching. They rose as one and began to move out. We also saw the den of a pack of hyenas. All the adults were gone or asleep but two hyena cubs were out and could be seen. 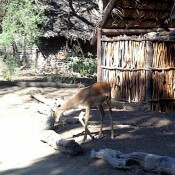 Actually, we didn’t have to leave camp to see many animal species. 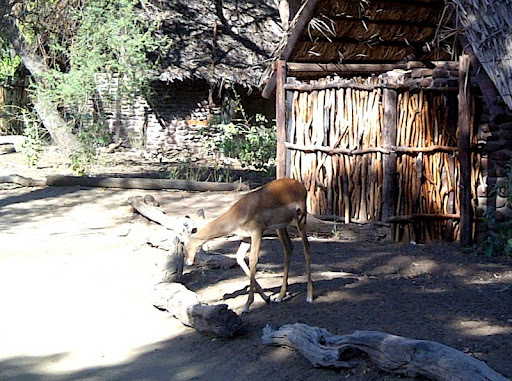 There were small steenbok grazing nearby inside our camp, striped mongoose, and of course monkeys. The monkeys were cute, but pests. At one point one brave monkey ran through the middle of us and grabbed a loaf of bread. 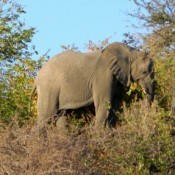 The evening game drive was notable for elephants. We saw a herd in the bush near us and as we passed we must have gotten between a small calf and the herd. The small elephant was scared of us and quickly ran by right in front of our vehicle. 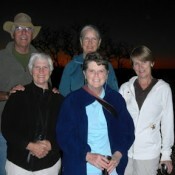 We brought snacks that night and stopped at a very high escarpment to enjoy sunset. On the way back we saw animals with the help of a spotlight. The only disappointment was that we did not see any cats. We should see plenty when we go to the Okavanga Delta in September! It was a perfect vacation. We enjoyed wonderful Fall weather, not too hot, not too cold. The evening skies were clear and the stars were spectacular. We spent hours under the big tree near the fire eating our meals and just hanging out talking and reconnecting with our good friends. It was a great trip. 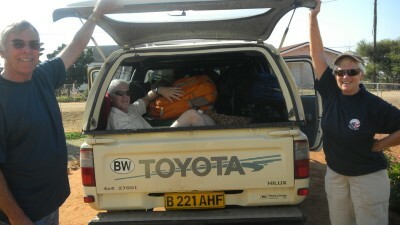 This entry was posted in Peace Corps, Service - Year 2 and tagged Botswana, Mobley, Peace Corps, safari, tuli-block. Bookmark the permalink. This is very exciting. I think anyone would love to visit Africa after this account. Good luck on the rest of your vacation. I still look forward to your updates.